Earlier this year the Oakland Businessmen’s Garden Club dedicated a memorial garden to Howard Gilkey at the Lakeside Park Garden Center, Oakland, California. The author here recalls some highlights of his long friendship with Howard Gilkey. Soon after coming to Oakland in July of 1927, Howard Gilkey paid me the compliment of dropping by to introduce himself. This was the beginning of a friendship which ended only with his death last year. 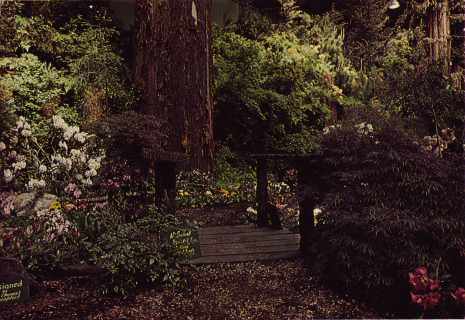 At the time, one could not be active in garden club circles for long, and not learn about Howard. 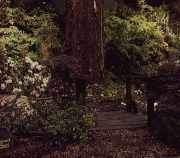 He was known as a talented graduate of the University of California School of Landscape Design, also as a former Santa Rosa Highschool student who had worked for Luther Burbank. I was told that he was so gifted and so self-assured that he was equal to any challenge in his field. It was said that Howard would not hesitate to accept a commision to landscape Heaven; you can “bet your boots” he would have done a magnificent job. While there were times one could, figuratively, wring his neck with good grace, he was so fantastic, in the sense that he was unbelievably great, one was awed by his talents. He was endowed with imagination, vision, and artistic skill. Harold Austin and Howard lunched together in October of 1928, to confer on the landscaping of a residential subdivision Harold was planning for upper Trestle Glenn in Oakland. Their conversation drifted into the subject of gardens, plants and flowers. It was so enjoyable they invited George Furniss and James Cobbledick, also dirt gardeners, to join them the following week. Humorously, they dubbed themselves the Snail Hunter’s Club. By the time I joined the group in February of 1929, the club had a roster of about thirty prominent business and professional men. Of course, Howard was the “spark plug.” We loved him for his buoyant, boyish spirit and great enthusiasm. This then, is the simple story of how America” first Business Men’s Garden Club originated. About the same time three of us, members of the two main garden clubs in the community, obtained a joint meeting at the home of Adeline Frederick, a landscape architect residing in Berkeley, to propose that the clubs jointly sponsor a garden show to supplement the many flower shows. Professor E. O. Essig and Professor Harry Shepherd, both of the University of California faculty, and Mrs. Frederick represented the Garden Club of Alameda County; Harry Butterfield, also of the University, Dr. E. F. Card DDS and Mr. and Mrs. Alfred Shulte represented the Alameda County Floral Society. The group endorsed the concept enthusiastically. Professor Shepherd volunteered to make the show design a class project; Joseph Callahan, a dahlia fancier and Deputy County Assessor and I agreed to obtain a site; William Steinmetz, Oakland Tribune account executives offered to obtain publicity; Harry Butterfield was willing to edit the prize schedule and Dr. Card thought he could raise the necessary finances. The Piedmont Garden Club came in later. Mr. Ed Wells, of the Weaver-Wells Studebaker Agency at 29th and Broadway, Oakland, agreed to let us have half of his glass-enclosed showroom for our show. The wide acceptance of our Spring Flower Festival in 1929 encouraged us to plan a bigger show the following year. Here is where Howard and the Business Men’s Garden Club enter the picture. Putting two and two together, our idea of a garden show, especially one sponsored by a men’s club, was a natural. At a special evening meeting, the three of us submitted our plans for expanding the Garden Show. Howard jumped at the idea. In his enthusiasm, he volunteered to design and produce such a show without fee, with the assistance of his wife Elsie, formerly secretary to Dr. Aurelia Reinhardt, President of Mills College. Callahan and I agreed to find a larger site for the Show, others volunteered to raise funds and enlist participation of all of the Flower and Garden Clubs in the Community. Earl C. Anthony, Packard Dealer consented to let us have the entire ground floor of his beautiful Maybeck-designed auto showroom overlooking Lake Merritt. On a Sunday, in the Spring of 1930, Howard designed and produced a garden show which enthralled some 15,000 people. Mr. Anthony was so enthused with the response, he offered us a five-year contract to use his building with all expenses paid. Looking ahead to bigger things, we politely refused the offer. We had decided to hold our next show in the Oakland Auditorium arena, despite the polished hardwood floor. Howard used Formal Gardens as a theme. He designed a great fountain in the center of partierre gardens and formal beds. Howard and Elsie again donated their services. The Exposition Building, with dirt floor, had been completed meanwhile, so it became the site of the Third Show entitled Moorish Gardens. It actually was the first of Howard’s famous shows with themes. The demands upon his time became greater as the size and importance of the shows increased, so from then on he was compensated. In this introduction of the unified design, each exhibitor was given a definite assignment to carry out a part of the overall picture. As Howard became a better, more experienced showman, so did the exhibitors under him. It was in this show that the idea of a trade show confined to garden accessories was added. For years, Howard and I could not agree about the origin of the Garden Show. Howard insisted that the show he designed for the Earl Anthony building was the first. I knew that the Weaver-Wells show was the first. We eventually compromised our difference by his accepting the Weaver-Wells Show as the forerunner of the one he designed for the Anthony Building. But, in numbering the order of the shows, Howard’s date is used as the first. He wouldn’t have it any other way. 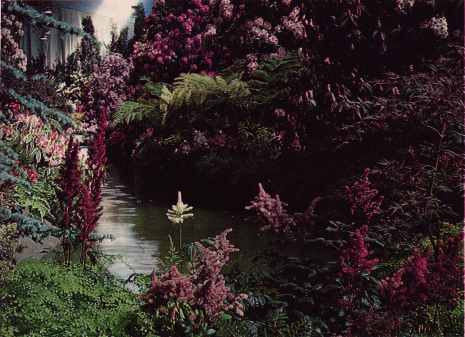 Howard’s concept of flower shows with themes was unique. At the time, the Philadelphia, New York and Boston shows were tops in the nation. These shows used the unlimited resources of wealthy eastern estates. Their individual exhibits surpassed ours in quality of plant material, but each exhibit was unrelated, so their shows were a beautiful collection of exhibits. There was no thought of a unified picture or theme. Our Show was not really recognized until an article in the October, 1950, issue of Saturday Evening Post gave it both national and international publicity. There were six pictures in color, with a feature article by Frank Taylor, which extended over Pages 34, 35, 142, 144 and 145. The sub-title, “The fellows think nothing of rebuilding a redwood forest or a mountain cataract” also put the Business Men’s Club in the limelight. The article made a national figure of Howard, and drew attention of the world to the great shows he created. Did he love it? I ask you? He deserved every bit of the acclaim. I’m reminded of the dear lady who asked Howward how he was able to get the giant redwood trees into the buidling. She was satisfied with his answer “I drop them in through holes in the roof.” The trees were so real in appearance, others may well have also wondered. Howard was irrepressible. Naturally loquacious, people were soon aware of his presence in a group. He wasn’t the type you could “put on the back burner.” An amusing incident happened at a meeting of the Garden Club. Harold Camp, Minister at the time of the First Baptist Church in Oakland, brought a fellow preacher to the meeting as his guest. When Harold introduced his guest as a visiting Baptist Minister, Howard blurted out “I’m a water lily, too,” whereupon Harold Camp countered with “You’re lucky I didn’t baptize you, I’d have held you under longer.” Inferring, of course, that Howard always had his mouth open. True, for it was impossible to subdue Howard. Nevertheless, like the commercial on television, everyone listened respectfully when Howard spoke on horticultural subjects. Although Howard identified himself then as a Baptist, he really sought religious comfort in the modern philosophies. A show experience we had with him, was a case in point. Having recently embraced a current new philosophy wherein he needed symbols for inspiration, he made a bas-relief of a symbolic figure about ten feet tall, and provided a setting for it in the show. He somehow or other managed to have a platform built to support an organ within the mountain mass over an entrance tunnel. The tunnel was lined with Easter lilies and maiden-hair ferns. The combination of Easter lilies and organ music was too much for some recently bereaved people, who turned and left the show. In another show, Bestor Robinson, a member of our Board of Directors, traced a gas supply line to its shut-off and extinguished Howard’s inspirational flame in the center of a reflecting pool surrounded by orchid plants. Howard turned it on. Bestor turned it off, and so on, until Bestor gave up. He explained that the flame was needed to keep the orchids warm. Howard told us once that he changed his personality, that he had become an entirely new man — he was now modest and had conquered his vanity. We took him seriously until we spotted him strutting among the show crowd, dressed in white from head to foot, wearing a straw hat. This demanor was but a temporary idiosyncrasy — a manifestation of his strong independent personality. So long as it didn’t dull his inspiration for future magnificent shows, who dared criticize him? When the show covered several acres of space indoors in the Auditorium arena and the Exposition Building, plus that of the outdoor gardens, greater demands were made upon Howard’s energy. Fortunately, he abounded in vitality. Like a field marshall, he kept many details of the vast show under control. As he hurried about the show during construction, he was surrounded by a group of exhibitors eager for instructions. Howard kept his plans locked-up in his head. He had the uncanny ability to remember every detail, and easily placed each in its proper place. He had an unusually keen sense of observation. Hurrying by, he could spot a misplaced object, small though it might be, pause to order it shifted and continue on his inspection. He would remember to check it the next timme around. Howard has been known to go to great extremes to correct or eliminate a detail which actually was unimportant in a big show, but he was a perfectionist, he could not accept less. The element of timing in a show which dealt mostly with perishables, could only be appreciated by participants. Nervousness and excitement prevailed the last few days before preview night; this was a time of feverish activity and confusion. Imagine our concern, just before one show, when the unions threatened a boycott on the eve of the show opening. Fortunately, Howard was able to shake-off these annoyances and frustrations and “go on with the show,” but he had to withstand great physical and nervous strain. Despite worrying up to the last minute he could draw on his great energy and be resplendent at preview, which after all, was his night of triumph — he revelled in the acclamation and loved the adulation and affection of the ladies. Howard, the perfectionist who knew no bounds, was a problem to the Garden Show Board of Directors. Our efforts to curb his extravangances [sic] proved to be fruitless. He refused to honor a budget. We never knew until months after a show, how much it actually cost. In the early years, until Abe Leach, our President, promoted a society preview for the purpose of obtaining advance income, the members fo the Board of Directors were required by the bank to give their personal signatures on the note to borrow money for pre-show costs. You may be certain the notes were paid off with the very first receipts. At one time, we hoped to induce Howard to provide us with a show construction plan so we might let a contract for the heavy construction, but he would have none of it. He wanted to be free to build and tear down and rebuild to obtain a desired effect. He had to have carte blanche; he could not be fettered by such things as finances. Knowing the situation, it is apparent that with rising costs, the great shows reached a point where they could no longer pay their way and they passed out of existence, leaving only rich memories. Howard contributed much to raise the standard in gardening, for the shows had great educational value. They provided inspiration for more beautiful gardens. They taught arrangement, engendered enthusiasm for new and improved plants and how best to use them. He created magnificent and beautiful natural pictures with plant material which probably will never be duplicated for there was no limit to his imagination. For recreation, he developed a strain of colored alstroemerias. He used his facile pen and respectable vocabulary in writing poetry and in publishing an illustrated book about his philosophy of life. He played the piano with verve — he even wrote an opera. He loved to recite and quote in dramatic fashion, for by nature he was a great showman. He also excelled in garden design and has left many fine gardens constructed while in private practice as a landscape architect. Naturally inclined toward the theatrical and the spectacular, his concept of “Woodminster” above the Joaquin Miller site, is an outstanding example of his skill. Unfortunately, he was denied the pleasure of building it because he expected fabulous fees for his services. This is my humble effort to share with you, my experiences with a genius. It is comforting to me to hope that I may have, in a small way, helped to provide Howard with an opportunity to, realize some of his ambitions. “Enchanted Forest” theme (1964). Waterfall and stream with astilbes and ferns. Photographs by Kenneth Bergman. “Valley of the Giants” theme (1963) Redwoods reconstructed from numbered pieces of bark.